Ignoring the confusing letters for the moment, you can see the basic outline – the vee-neck, and the bottom edge that defines the width of the finished piece. I cast on 13 stitches at A. I knit a garter diagonal band, increasing on one side of the strip and decreasing on the other every other row to achieve the angle. 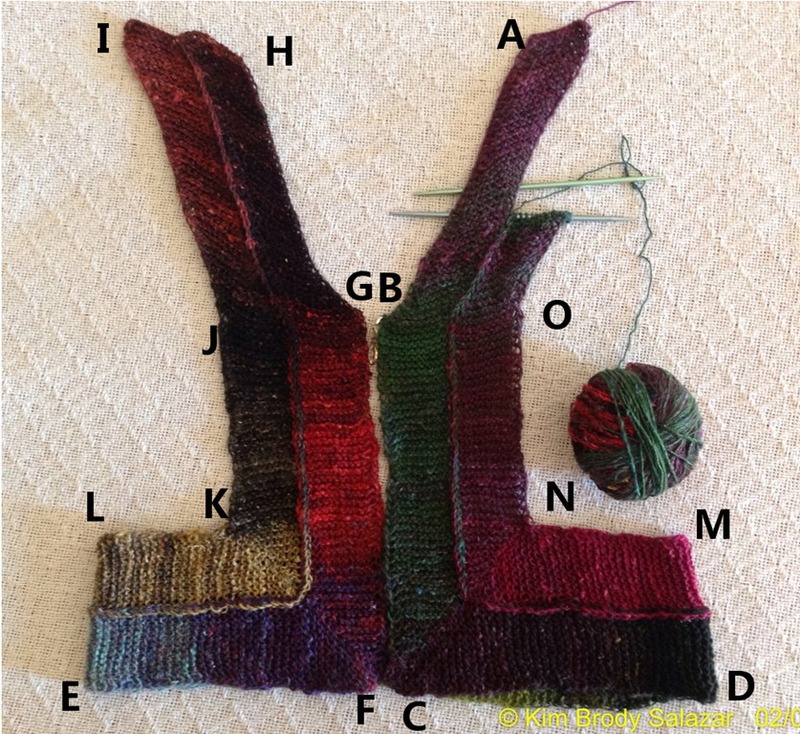 When my neckline was deep enough (B), I switched to working straight – a plain old 13-stitch strip until I was about 2 inches shy of my desired length. Then I worked a wrapped short-row miter, making the corner at C. I then knit across the bottom edge of the front, across the entire back (unseen, from D to E), then back across the front to the center point. Again, about two inches shy of the center point, I did another miter (F). After that I worked straight up to point G. I reversed the shaping of my initial angled strip to create its mirror image, from G to H.
Then exactly as I did in my Motley blanket, I cast off 12 stitches, added 12 and proceeded to work the second strip, knitting it onto the established edge strip as I went along. I worked miters again at points K and N. You can see I’m past O, headed back up to the shoulder where I initially cast on. I will continue in this manner for one more strip. That will make the shoulders of the piece about as wide as the shoulders of the target tee-shirt I am using as my size model. At that point I’ll have to figure out how to fill in extra bits on the sides and in the center of the back. But so far the thing has come together exactly as I envisioned. And quickly, too! Why is it called a Samosa vest? I like it (colors, concept, shape) but am hung up on the name. The reason why is twofold. First – this is the daughter of my Taco Coat. Slightly different construction, but same basic idea. That oddly shaped project was named after a tasty edible that takes its shape by folding and wrapping because at mid point, the thing kind of looked like a taco shell. So does this one, in a way. I started out with a looonnnnggg strip – kind of like a strip of frozen samosa wrapping. It wiggles a bit, and there are a couple of miters in it, but it does look like a strip of rolled dough. A couple of folds, a quick seal seam on the shoulders and voila – it should become a finished bit of yarn tastiness, a vest that wraps around the wearer, who stands in for the spicy filling. Plus, being in India – land of 10,000 snacks and even more colors – it seemed to be an appropriate (and with hope, an affectionate) tribute. I have just stumbled upon your blog and think it is great – I love the way you say what you think and have a very clear voice. I came through clicking on blackwork and thought you might enjoy bits of my blog, especially my Elizabethan jacket blogged here http://www.addisonembroideryatthevicarage.co.uk/2012/11/03/embroidered-elizabethan-jacket-the-flowers/. I look forward to carrying on going through your archives and reading more.